The Euro gained on Friday as risk-on sentiment eased the demand on the U.S. Dollar. The Industrial Production data boosted the common currency, while the Michigan Consumer Sentiment came below market expectations adding more pressure on the greenback. While the single currency may be seeing gains, the overall outlook for the EU economy remains weak. Germany and Italy remain in the spotlight as their economy is flashing red and their short-term growth seems limited. 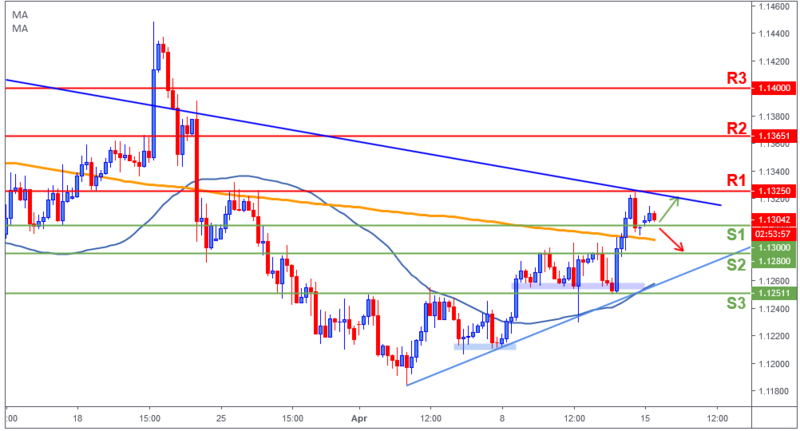 The bulls were able to break and close above 1.13 on Friday, but the trend on the Euro remains bearish until the overall sentiment is changed. Today, we have a very slow day in terms of macroeconomics data, so we expect a low volatility day with no major price movements. The Euro broke above 1.13 on Friday continuing its recent short-term bullish trend, which started since the beginning of April. The bulls are facing major resistance levels up ahead. 1.1325 (R1, where we also find the medium-term bearish trend line) being the first important level and then 1.1365 (R2). But if momentum weakens and price couldn’t break above 1.1325(R1), then we expect a pullback towards 1.1280 (S1, also the recent bullish trend line).